Control 7, Inc. 55 Scotland Blvd. Unit #3. In Bridgewater, MA 02324. 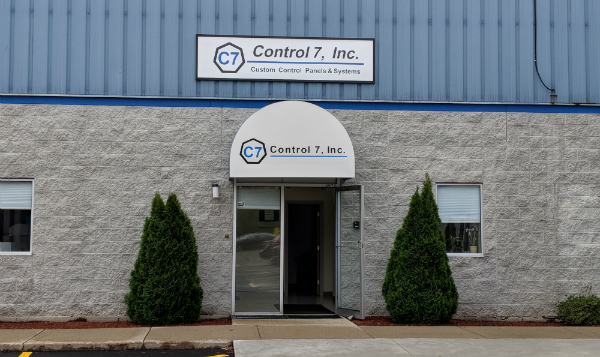 Founded in 1983 by 7 Engineers from the Process Control Industry, Control 7, Inc. has become a highly respected source for superior quality control panels, on time delivery and competitive pricing. We fabricate electric, electronic and pneumatic process and machine control panels. We offer complete Control Panel Design services as well as PLC programming and AutoCAD drafting. From a small pump control panel to a series of complex Bio Technology process controls, Control 7, Inc. systems are in use around the world. Pharmaceutical, Chemical, Machinery Control, Energy, Water, Wastewater and Filtration, Pulp and Paper, HVAC as well as Food & Beverage are just some of the industries utilizing control panels manufactured by Control 7, Inc.
Control 7, Inc. is also a manufacturer of computer generated Engraved Nameplates and Graphics, as well as Cables, and Wiring Harnesses. We also provide Sub Contract Manufacturing Services. We maintain several U.L. and C.U.L. listings. UL stickers are provided at no additional cost. All panels are built in accordance with U.L. and NEC standards and receive a full inspection before shipping. We employ a full time Quality Control Manager to assure your system arrives without defects. Space for customer Factory Acceptance Tests is also provided. We are located in a 15,000 sq. ft. plant in Bridgewater, MA. We are conveniently located near the intersections of Rt. 495 and Rt. 24. Please contact us to schedule a visit and see why Control 7, Inc. has truly become the”Engineers Choice For Control Panels“.